Boarding a United Airlines internal flight? 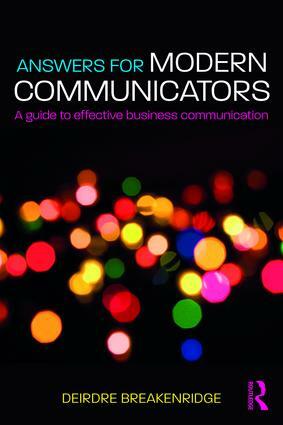 Don't Miss interview with Deirdre Breakenridge, author of, Answers for Modern Communicators! Deirdre Breakenridge is Chief Executive Officer of Pure Performance Communications, USA, a firm that provides strategic communications consulting for building effective integrated marketing, public relations, and social media programs. She also teaches social media and PR classes at the University of Massachusetts—Amherst, USA and is a LinkedIn Learning Instructor with video courses in PR and marketing. Visit her Featured Author page to learn more. Deirdre Breakenridge gives a 30-minute interview about her book, Answers for Modern Communicators, on Best Seller TV, part of the C-Suite TV Network. Only a handful of interviews are selected, but we're happy to share that hers is now available on United Airlines Inflight TV. This book provides students and professionals with practical answers to important career and communication questions, helping them to communicate successfully in a business setting. Communication expert, Deirdre Breakenridge, examines the ways in which professionals can make the most of their careers in a fast-changing media landscape, offering advice on how new and seasoned executives can utilize and adapt to the latest modes of communication.